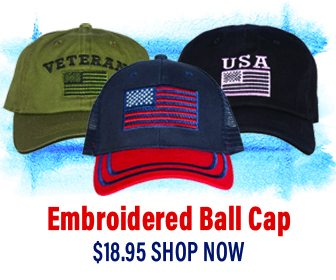 Your heart is pounding, your forehead sweating, every muscle tensing and goose-bump rising; before you can think—before your brain can even conjure the word “snake”—your limbs have frozen in place. Your body is alerting you to what your eyes have seen. As you halt, you finally register a little Garter snake as it slides off through your garden. Thousands of years of vulnerable Homo sapiens struggling to evade snake predation have led to this moment, your response the result of eons of evolution. Your response is genetic, intrinsic, deeply rooted, but also utterly useless. Garter snakes are harmless unless you are a cricket or a leach or a slug or a worm. In our ever-urbanizing world, these fear responses have no practical application. In an average year, only six people die from snake bites in the US. These hisstrionics—pardon the pun—seem rather absurd in the modern context. They are “outdated relics” of a more vulnerable past. Today, snakes ought to be the fearful ones; human development incessantly fragments and degrades their natural habitats. The omnipresent roadway which severs and divides also acts as a deadly lure. Cold-blooded snakes drawn to bask on the warm asphalt quickly become roadkill. On top of all this, pesticides and other chemicals continue to poison their land and waterways. Backyards then become safe-havens, places of security amidst loss and destruction. Snakes are enticed by warm rocks to bask on and dark, cool places to hide. Meanwhile, humans become ever pre-occupied with one central question: how to get rid of snakes. This desire is genetic and instinctual, but has little rational founding. 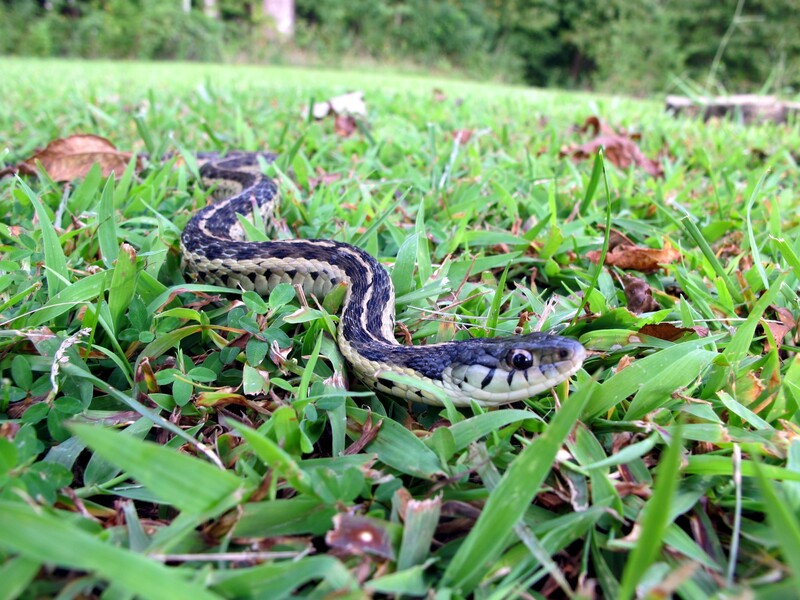 A snake’s presence might logically be considered a blessing bestowed on garden ecosystems. Snakes prevent damage to flowers and vegetables, feeding on slugs, spiders, Japanese beetles, and small rodents. They then leave behind excellent fertilizer in the form of droppings. In addition, snakes ‘step’ lightly; no hole-digging, leaf-munching, or plant-trampling here. As all snakes, the black racer is very important to the ecosystem. They dine on animals most people consider vermin like rodents and moles. For example, the Southern Black Racer, common in many states including Florida, brings all of these backyard blessings and more; many Peregrine Falcons rely on Black Racers for their diets. They are timid creatures, entirely harmless to humans—the greatest offense they can conjure is a slightly foul smelling ‘musk,’ and they only bite when provoked. Yet when it comes to this black snake, Florida is no safe haven; at the sight of this serpentine neighbor, people often respond with violence. 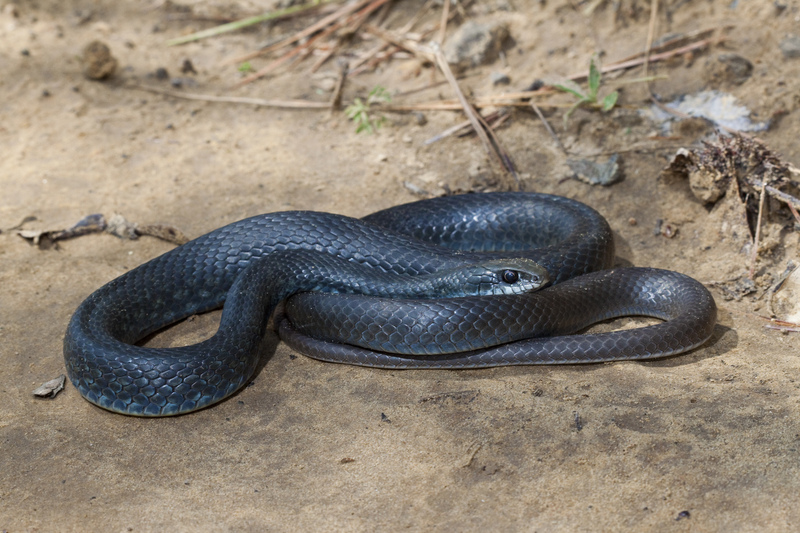 The Southern Black Racer is commonly misidentified as one of a few poisonous snakes in Florida, such as the venomous Cottonmouth Water Moccasin or Pygmy Rattlesnake, both of which have thicker bodies and blockier heads. (It is important to note that snakes are not poisonous—a word which reserved for oral ingestion. Instead, less than a quarter of snakes are known as ‘venomous’—indicating their capability to inject toxin.) To prevent such a blunder in your own backyard, a simple pause and visual check can help you determine if the snake is non-venomous. Remove potential hiding places for both snakes and their prey; piles of rocks, wood, or other debris. Mow your lawn, removing tall grass and undergrowth. Seal cracks around concrete porches and sidewalks, or storage sheds with space under the floor. Don’t leave pet foods or garbage outside overnight; these attract rodents which may attract snakes. But ultimately, as we continue to deprive snakes of habitat, we are depriving ourselves. Our own terror prevents us from learning to respect their ecological value as key players in the food chain, and re-discovering our own curiosity in their behavior, beauty, and bliss. And as any appendix or wisdom tooth will tell you, such vestigiality is not impossible to remove. Hey Buddy!, I found this information for you: "Backyard Snakes". Here is the website link: https://effectivewildlifesolutions.com/backyard-snakes/. Thank you.